FIxed ball base adapter. An easy way to attach to the Extra Grip or the Camera Tray Adaptor and holds a Double Ball Arm with the Ball Clamp. 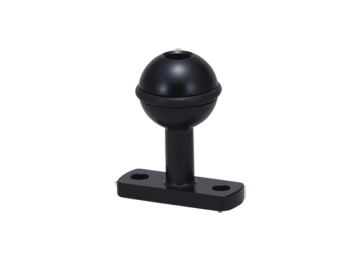 High quality & light weight arm serie made of �construction corrosion resistant aluminum alloy (anodized body). Fixed ball base attaches to the Extra Grip or the Camera Tray Adaptor and holds a Double Ball Arm with the Ball Clamp. High quality & light weight arm serie made of �construction corrosion resistant aluminum alloy (anodized body).